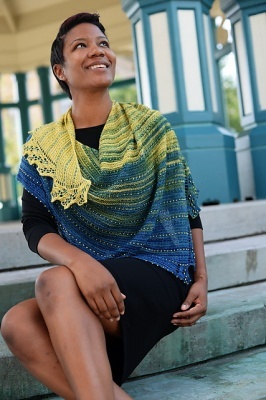 We are re-opening this web page for Pre-Orders of this most beautiful shawl. 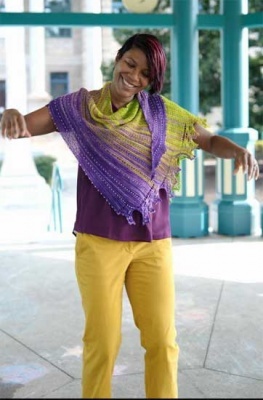 Just know that there will be a wait of about 4 to 6 weeks for the yarn to be dyed specially for your order. Please note our policy here on shipping and pre-orders. 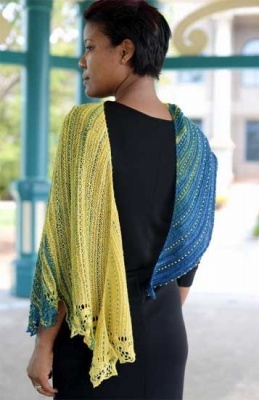 BitterBlue is a stunning beaded shawl design by Barbara Benson , available in two new and exclusive colorways from The Unique Sheep. The two new colorways were each inspired by a different stunning painting. For copyright reasons, I am not copying them for this web page but take a look here and here so see them. We are calling the colorway based on the first one BitterBlue and the second one is Magic Carpet. And frankly, they are both stunning. The photos you see on this page were taken by Barbara and show both colorways -- hard to choose just one, isn't it? 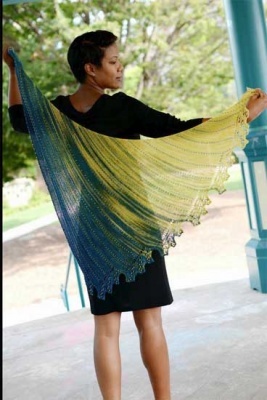 Each set will again have a total of roughly 600 yards dyed in your Gradiance choice, 6 skeinettes each. 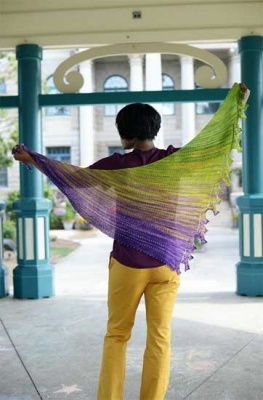 The original yarns sets were dyed in Luxe, a 600 yards set of a 6-skein Gradiance. This is, However, no longer an option. 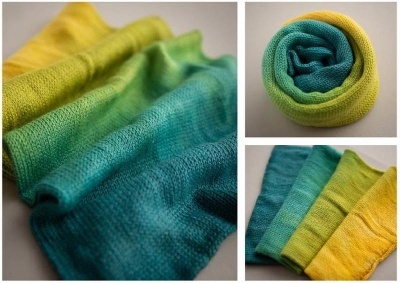 We have a wonderful substitute for Luxe, we offer here Kiri, a 80% superwash merino/ 20% silk. 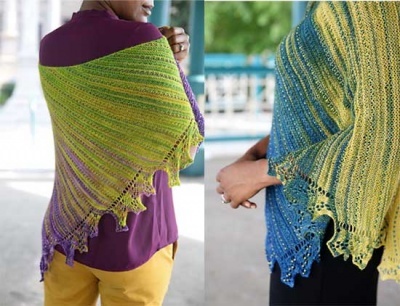 It looks and feels awesome -- and many test knitters preferred it. And this is what your kit will come in. Each kit includes lots and lots of beads, all size 6/0 -- four containers of four different colors, selected to work beautifully with the gradiance and with each other. 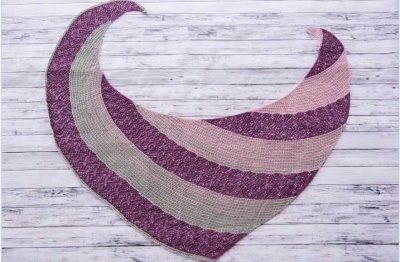 The pattern is currently available on Ravelry (link below). Barbara, the amazing designer, drops in periodically at our Heere Be EarthFaire forum to help with any questions and give any needed advice. Note that the kit will not automatically include the pattern. 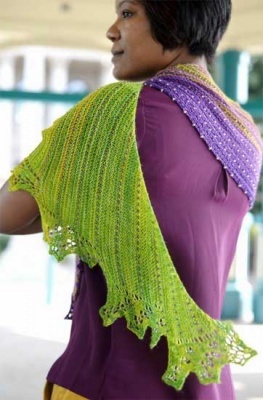 I know some knitters prefer to get it directly as a PDF file of the pattern from Barbara via her Ravelry web page . If that is how you would like to go, then set the "Pattern" drop-down menu to "No Pattern Needed." Alternatively, if you would prefer a printed copy, please make sure the "Pattern" drop-down menu is set to that and we'll get that to you in your kit. We also can send the pattern to you via email and if you choose that option, I will send it to you just before shipping out your kit. Make sure that the Pattern drop-down menu is set as you would like before you check out. P.S. If you have any special requests, feel free to contact us.